How much fun and thrills can you pack into a single casino? We head over to Spinit, a casino owned by Genesis Global and is open to South African online players. Licensed by the MGA, the UGKC and the Swedish Gambling Authority. Spinit presents as a no-frills casino, but that doesn’t mean no-thrills you can find more than 1,300 games from the best game providers of the gaming industry. Is fun what you’re truly after? Then let’s have a closer look at Spinit. Claim a deposit bonus package up to R15,000 and 200 free spins on first deposit. 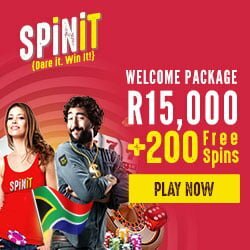 Head into Spinit’s colourful world of fun with a welcome package bonus of 100% up to R15,000, and a sweetener of 200 Free Spins. Sign up and deposit to get your bonus which you can select at the cashier from the dropdown box. 100% deposit bonus up to R3,000 + 200 Free Spins. 50% deposit bonus up to R3,000. 25% deposit bonus up to R4,500. In addition to this welcome offer, Spinit’s got something special for you, depending on the day of the week. Mondays, for example, is when you can get a 25% reload bonus of up to R1,500 by merely depositing on the first day of the week. As for weekends, take a “Weekend Spin!”, Spinit offers a 50% bonus to players who deposit a minimum of R300 on Friday or Saturday. Last but not least, there’s the Spinner’s Choice where you can score Free Spins, and a reload bonus on the Game of the Week – players get a free spin trial and a Reload Bonus on the Game of the Week, via an email sent out every Tuesday. The Spinit VIP plan offers much in terms of benefits. The list of perks includes premium customer service and personalised support via email, with a guaranteed response time of no longer than 12 hours. But besides the tailormade and individualised assistance, VIP spinners can look forward to Exclusive Weekend Promotions, special gifts for your birthday, an anniversary or simply upon your welcome to the VIP world, personal cashback offers and exclusive bonus plans! 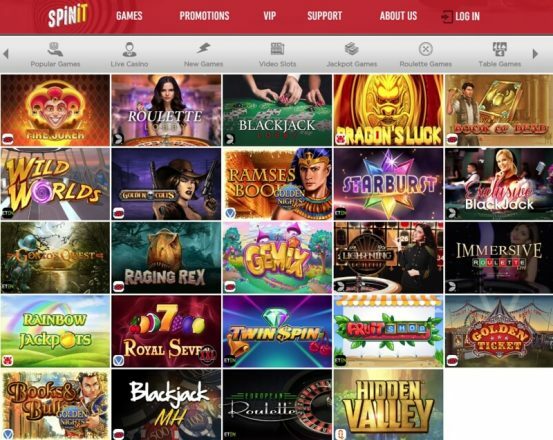 There’s no shortage of games at this casino – in fact, Spinit is well past the 1,300 game mark, and its portfolio is set to increase in numbers. Are you a Starburst aficionado or would you rather scour the narrow corridors of the temple in Book of Dead? Spinit’s got them both, together with titles like Twin Spin, Bonanza, and the best games from the best providers of the gaming world. South African players can enjoy works from NetEnt, Red Tiger Gaming, Oryx, Quickspin and Play’n GO. When it comes to live casino, you will also find productions from Evolution Gaming – we’ll tell you about this a bit further down. All the classics, all the glitz, all the excitement – at Spinit, you can prove your mettle at poker, blackjack, baccarat and plenty of other table games which come in different variants with their slightly different rules or bet levels. And if you’re looking for something even more challenging sit at a Live Casino table and face a live dealer for the authentic table game experience. You can play roulette, poker, baccarat and blackjack here too – the only difference is that you will feel the thrill of being at a real casino, with other players competing against you and the dealer at your table! Tables in this section are brought to you thanks to Evolution Gaming and NetEnt. Playing at Spinit is a walk in the park, and so is anything that has to do with depositing or withdrawing money. To deposit at the casino, you can use Visa or Mastercard (debit and credit cards), or you can use e-wallets such as Neteller and Skrill, and EasyEFT to transfer directly from your bank account. It’s pretty straightforward when it comes to minimum and maximum limits: R150 minimum deposit, while maximum deposits are capped at R75,000. On the other hand, withdrawals can be made to the same two e-wallet methods (Neteller and Skrill) with the addition of ecoPayz, and you can always choose to withdraw to your bank. Limits range from R150 to R35,000, except bank transfers which start from a minimum of R1,000. Withdrawals are usually instant, but bank transfers may take between three and five working days. You shouldn’t have any SNAFUs at Spinit, but if something doesn’t go the way you want it to, customer support is a couple of clicks away. Spinit support is open between 07:00 and 00:00GMT, and can offer their friendly and informed assistance via email, phone or the instant live chat service. Spinit doesn’t take too much of your time to get you started, allowing you to focus on the essential: having fun. Spinit casino has frequently updated promotions and a generous welcome offer, and it also makes it quick and easy to sign up, deposit and withdraw winnings. Subscribe to our weekly newsletter for the hottest casino bonuses, freshest online casino news and the latest video slot game reviews. Thank you for signing up to our weekly newsletter. A confirmation notification has been sent to your provided email address. You can unsubscribe at anytime via the unsubscribe link at the bottom of our emailed newsletter.